We have now followed up our award winning wrist wraps with what we think are the best knee wraps you can find on the market today. We think our powerlifting knee wraps are the best due to our unique combination of superior support, flexible yet strong materials and of course designs you won’t find anywhere else. If you’re looking for the best knee wraps for squats, leg presses or just some additional knee support for your workouts then look no further. Our dedication to our products is due to the fact that at our core we are athletes ourselves and we strive to create the best products you can find on the market today for our customers. 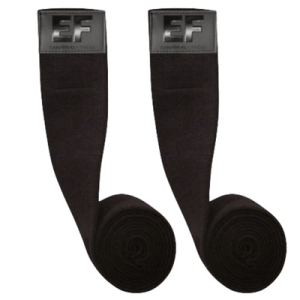 For a limited time you can get our brand new knee wraps at a special pre sale price. This price won’t last and will go back up the regular price, but until then you can get a great product at a great price. Orders will ship the week of October 9th, 2017. Don’t wait and order now! What Are The Best Knee Wraps For Squats? When it comes to knee wraps you want the most support you can get, which is why it’s recommended that you get powerlifting knee wraps for the most support for your knees. The reason that additional support is needed is because leg movements like squats, leg press, leg extensions and other exercises put a lot of strain on our knees. This is where a great pair of knee wraps can be a life saver as they provide you with additional support for the knees and when used as a preventative measure before any knee pain even occurs they can help you protect and maintain healthy knees for years to come. Our knee wraps have been tested by bodybuilders, cross fitters and by record breaking powerlifters and it’s for this reason that we believe they are in fact the top knee wraps for squats you can find on the market today. Best Knee Wraps of 2017? For 3 years straight our wrist wraps have been voted the best in the industry and now with the introduction of our knee wraps some have started saying that they could in fact be the best on the market in this category as well. This was our goal when we set out to start producing knee wraps and we were determined to take that same level of dedication to detail and quality that we put into our wrist wraps and put them into our knee wraps. We don’t say this just out of the blue, below you will find what some of the top fitness review sites on the internet have said about our knee wraps. One thing we understand other than providing the highest quality products on the market today is that we also provide the best customer you will find as well. We stand behind our products and we back that up by offering a best in the market 6 Month No Hassle Warranty on our knee wraps. If during the 6 months after your purchase your wraps tear, rip and don’t hold up like they should, we will send you a brand new pair absolutely free of charge to you. To make it even better we also offer a 30 Day Money Back Guarantee, if you are not satisfied with your purchase within the first 30 days you can return the wraps to us for a full refund.